When a writer chooses to call upon myth and folktales in her work, readers generally feel comfortable—most readers like myths and fairytales and are accustomed to poets who borrow, subvert, update, retell, reframe and combine age-old narratives and wisdom tales. What’s the purpose behind such borrowings, though? Reader appeal? Familiarity, or the opportunity to twist the familiar? Or does myth serve to involve the subconscious, opening doorways into dream? When a writer chooses to employ the folktales of a culture other than her own, there’s even more to question, such as the significance of that culture to the writer or to the reader, and the possibility of comparison or the specter of alienation. 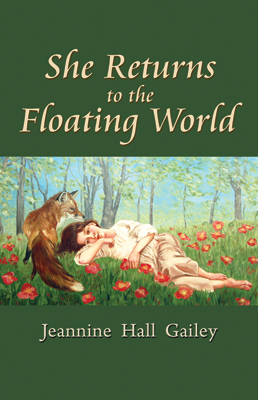 Jeannine Hall Gailey’s collection She Returns to the Floating World enjoins the reader to entertain various possibilities for myth’s value in the poem and suggests that even folktales that may be foreign to the reader—or the writer—offer human insights that span centuries and cultures. These narratives can be seen as codes, specialized for each community, reminding human beings of the social order, the risk of outlying, the need for moral behavior such as loyalty and keeping one’s vows. In other poems, the wife returns, perhaps in a different form, and wants what is most basic: “a hut of mud where we never see the stars,” for example, or children to raise, even though she admits that she is the kind to “tear things apart.” This urge develops in different ways, most notably as a metaphor of a this-worldly image in “She Likes to Pull Things Apart,” where the woman studies biology: “She dissected pigs/loved cracking the jaw” and in “The Animal Heart: She Warns Him” when the speaker reminds her lover that even though she’s shed her animal shape she retains “the desire to crack bones between delicate teeth.” Alienation, isolation, ghosts, all signal haunting by women who straddle two environs. The edges between the floating world and the spirit world, or the spirit world and the “real world,” or between cultures are all examined here, most often through employing Japanese symbols or literary and mythological tropes. Some of the collection’s most moving or terrifying pieces deal with the inability to produce viable offspring in the biological and in the metaphorical sense, a snarling of the code that Gailey references in many ways (DNA, C++, language, culture). Gailey introduces and explores such themes in “Half-Life,” “Why We Cannot Have Children,” “What Was Lost,” and “When the Bush Warbler Returns” (the last one particularly beautiful). The unrealized offspring are often potential monsters, however. Motherhood seems as mythical as dragons—perhaps more so—and unattainable. The insubstantial character of the fox-wife, who is partly spirit, keeps her from completing the environmental, Jungian, yin/yang code of fertility and fruition, life and death, in the “expected” manner of human beings. The “failed” outcome illustrates another painful byproduct of the kitsune’s straddling of the human and spirit worlds. The reader unfamiliar with Japanese folk tales won’t be stopped by that lack of background because these poems inform us of the originals while pushing their legendary qualities into a more contemporary place. What Jeannine Hall Gailey does with this collection of myths makes the poems as a collection relevant to our times, complex and culturally-diverse as they are. A line from the title series of poems encapsulates the experience: “You have to be more than human to begin with.” You have to be human and spirit, human and animal, human and legend. Ann E. Michael is a poet, essayist, and educator whose most recent poetry collection is Water-Rites (2012). She lives in eastern PA where she is Writing Coordinator at DeSales University. Her website: www.annemichael.com.